Zion has always been on my list of places to see. I finally got there earlier this month with my wife and son and to say the least, it did not disappoint. We were there a week, but this post is about an exceptional hike we took on the second day of our trip. The main canyon of Zion was carved out by the Virgin River over millions of years, similar to how the Colorado River carved out the Grand Canyon. Zion Canyon is on a much smaller scale but it is nonetheless very impressive. 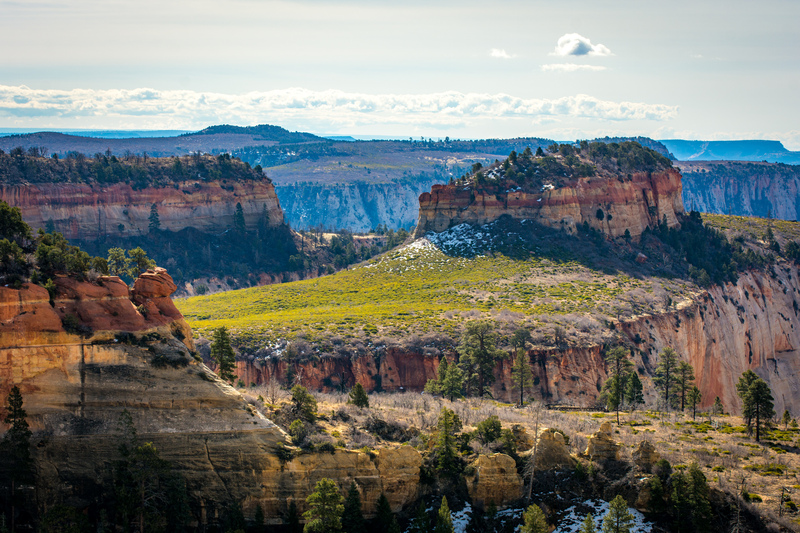 Sheer cliffs jut out of the canyon floor and shoot skyward over 2,000 feet like bread popping out of a toaster. If you want the nitty gritty details of how Zion Canyon was formed, see them here. 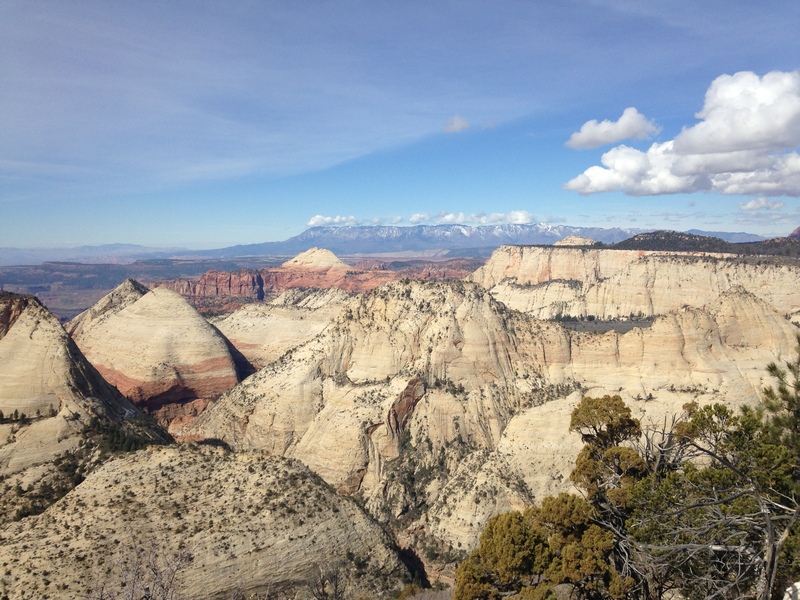 The hike starts at The Grotto picnic area, stop number 6 on the Zion Canyon Shuttle Bus. I’d like to say we took the bus to The Grotto but male obstinance on my part prevented this from happening. I read online that you could drive into the canyon before April 1. After that you had to take the shuttle bus because there is simply not enough room to handle cars. Since it was March, we drove into the canyon before sunrise, hoping to beat the crowds. We soon saw a flashing sign telling private cars to turn around. Somehow this registered to me as a foreign language and I pressed on to The Grotto. We found an empty parking lot as the first shuttle bus of the day rolled in. A gang of folks got off and I realized that the trail would not be ours alone. I also realized that all of these people would most likely be going up the famous Angel’s Landing trail which turns off of the West Rim trail about two miles up. The first thing you notice on the trail is that it’s paved. Yes, paved. 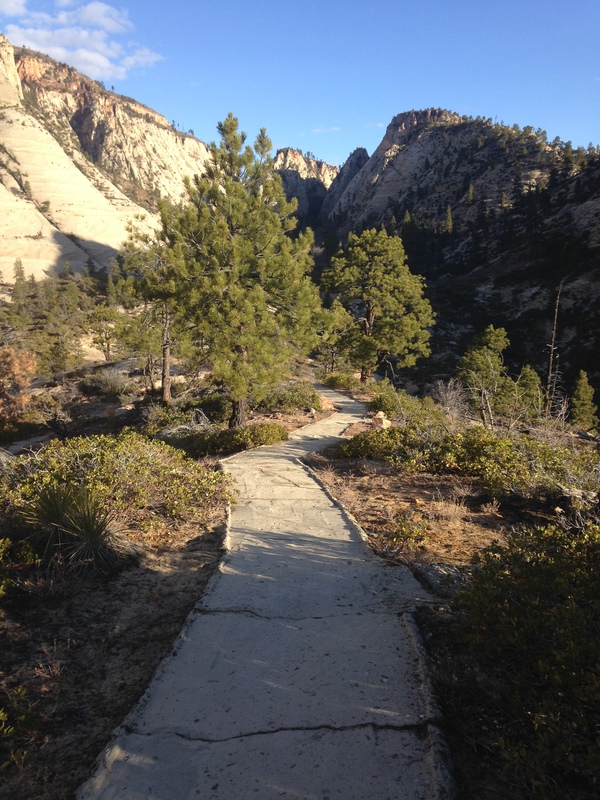 Built by the National Park Service in the 1920’s, West Rim Trail was paved with oil mixed with natural sand and rock. Major repairs in 1985 required 258 helicopter flights and a team of mules to haul in hundreds of cubic yards of concrete. 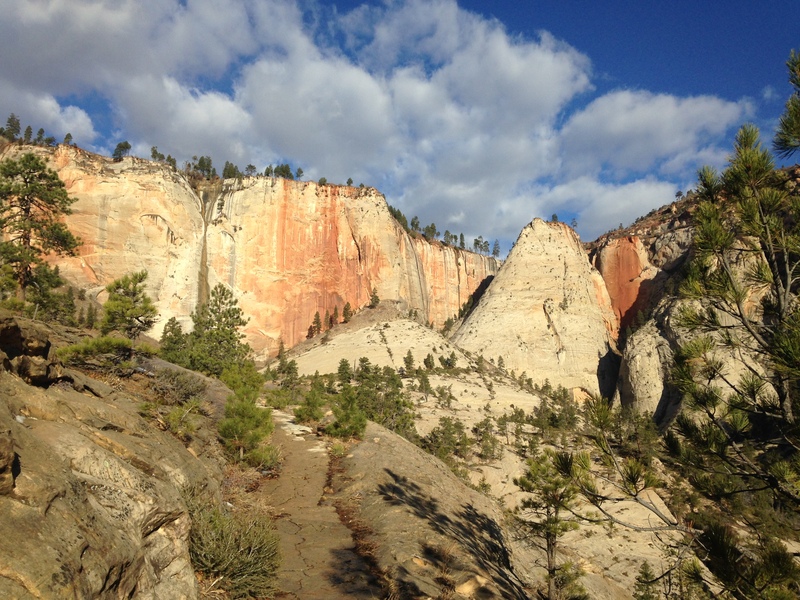 While I prefer natural material for trails, the concrete does a great job of preventing erosion and stands up to the millions of visitors who inundate Zion very year. The steep, but paved, climb up to Angel’s Landing. 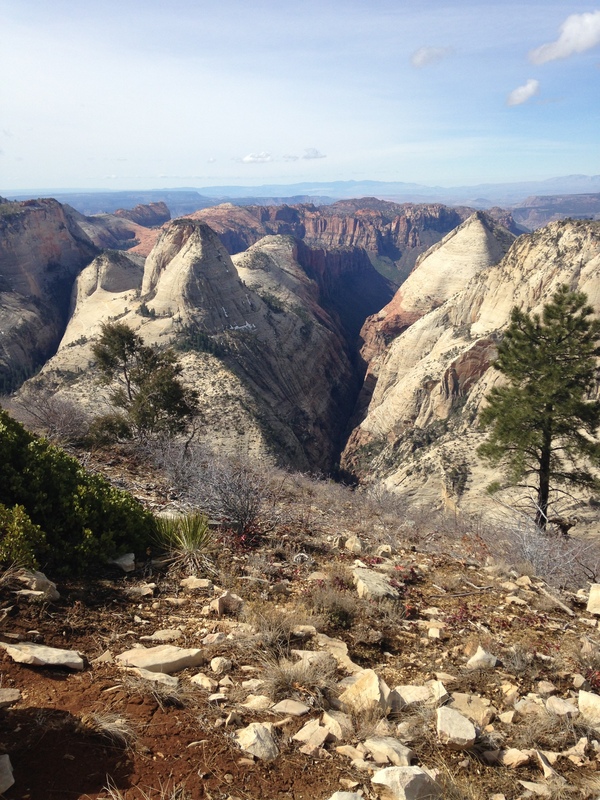 At the top of Walter’s Wiggles the trail turns right toward Angel’s Landing and left toward West Rim Trail. We headed left and immediately had the place to ourselves. We saw one speedy guy ahead of us and that was it. Everyone else was heading to Angel’s Landing and a quick glance to the valley below revealed hordes of people schlepping it up the switchbacks. It was time to get out of there! The next three miles brought some of the nicest hiking we’ve ever done. Jaw-dropping views were offered in every direction and while incredibly steep, the trail remained mostly paved and smooth. Eventually the paving gave way to a regular dirt trail as we headed up a narrowing canyon. 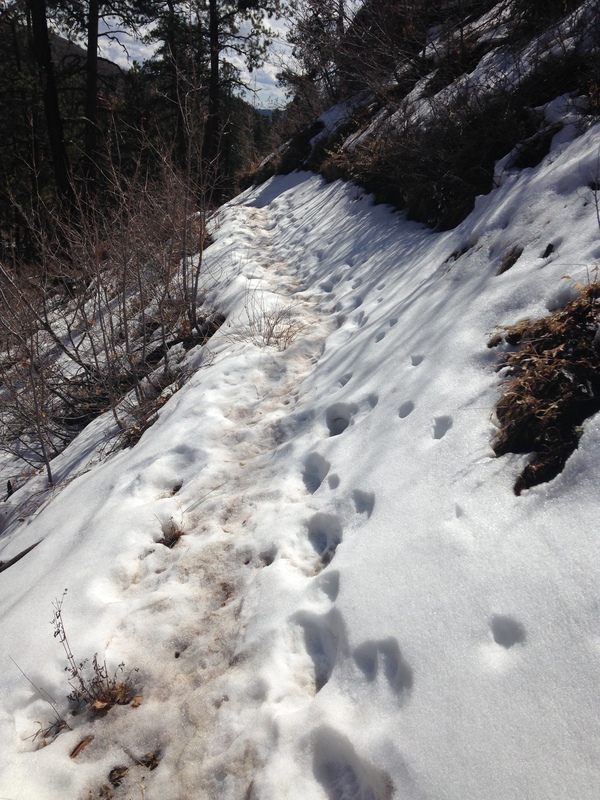 Here there was even some ice and snow that made footing a little sketchy at times. Another series of Wiggle-like switchbacks brought us to the West Rim itself at an elevation of about 7,000 feet. It was decision time. Return now and it’s still a solid 10-mile hike, continue on and do the loop on top of the rim and it turns into a 15-mile day. It was still early so I decided to do the full loop. My wife and son continued on for another mile or so to catch the views from the rim before turning back. My son’s 30-pound load of camera gear was beginning to take its toll. Still, they put in a tough 12 miles by the end of the day. Almost a yellow brick road to the top. On the way to the West Rim. The view from 7,000+ feet. I’d love to go explore that slot canyon down there. I knocked off the 5-mile loop on top of West Rim pretty quickly. I was back at the entrance to the West Rim by 1:00 p.m., leaving only the 5-mile return descent. A couple miles down I passed a group of women who started to talk excitedly about something they were seeing in the sky. I looked up and noticed a large buzzard-like bird circling above. One of the women exclaimed “it’s a condor!” Indeed it was a California Condor, one of the rarest birds in the world. As of 2016, only 226 of them were living in the wild. And Zion happens to be one of the few places you can see one. It was a fitting way to cap off this wondrous hike. Finally, I reached the turnoff to Angel’s Landing. The crowds were astonishing! No thanks! Hundreds of people milled around waiting for their turn up the chains. You couldn’t have paid me to go up. Hikers waiting to go up Angel’s Landing. No thanks! The last two miles consisted of the steep descent back to The Grotto with hundreds of my closest friends. Oh well, it was a price worth paying to have experienced the glorious hike to the West Rim. I found my wife and son waiting for me. I also found a parking infraction sticker on our rental car. Oops! I guess we weren’t supposed to park there after all. 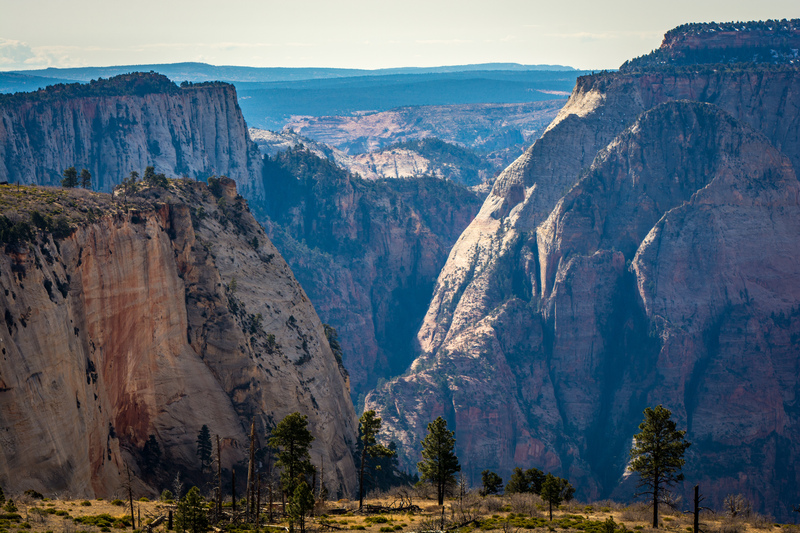 A final word: Zion is notoriously crowded at times. We thought we were going during a quieter month but there were still tons of people around. After a rough first day where I was questioning the entire trip, a quick adjustment of mindset enabled us to have a great time. Hike a few miles and the crowds are left behind. Get up early and you’ll have space. Go back in at the end of the day and again you’ll have plenty of elbow room. This place is so special that it’s worth the extra effort. And remember, use the shuttle system! We never waited at any bus stop longer than 10 minutes. Finally, I’ll leave you with a shot my son was trying to get all week. It’s a famous place to take photos and each evening there were 10-15 photographers lined up hoping the light would be just right. I think he got a nice one! Nice report Tom. Beats a day pounding around Buzzards Bay with Barry!